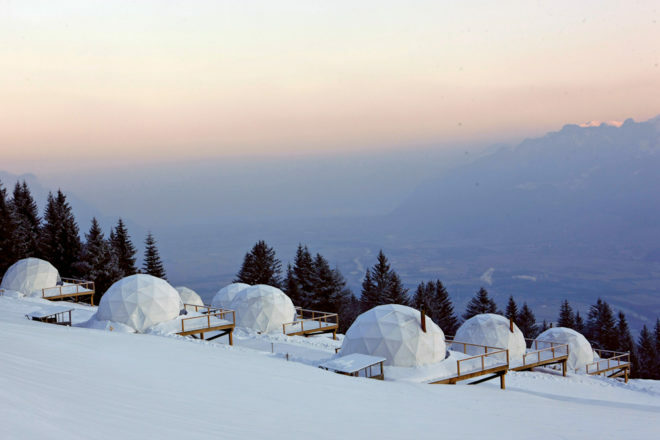 Whitepod’s geodesic pods blend into Switzerland’s natural enviroment. A room in Campi ya Kanzi constructed from local materials offers a luxurious stay. 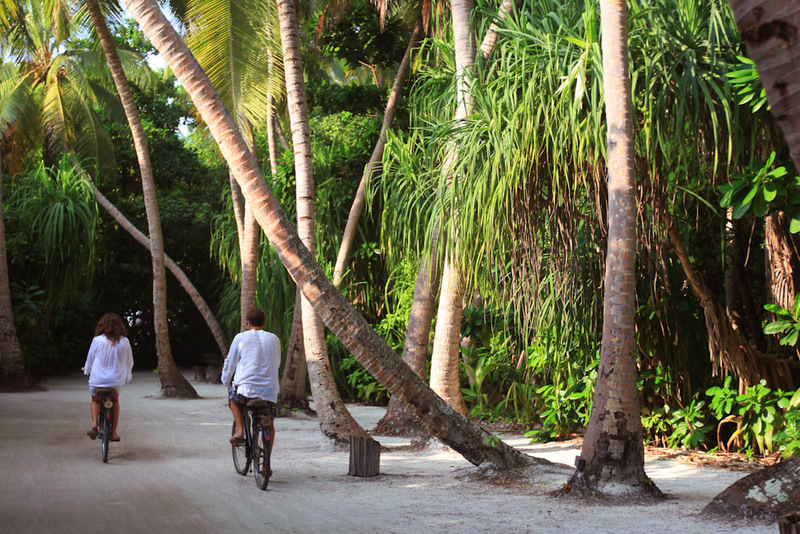 Cycle around Soneva Fushi’s blissful private island in the Maldives. Some of the world’s most beautiful resorts have jumped on the eco-warrior bandwagon to offer a high-end experience that doesn’t cost the Earth. These 10 eco-chic accommodations will allow you to live the luxe life with a clearer conscience. Eco-friendly tourism is no longer a niche, it’s now a movement; and eco warriors are no longer just socks-and-sandals-wearing hippies with mung bean-heavy diets. With a greater understanding of the need to reduce our carbon footprint, luxe-loving travellers are seeking ways to travel lighter without sacrificing quality. While any hotel that labels itself ‘eco-friendly’ probably has practices in place to reduce water, waste and energy consumption, these resorts are going the extra mile. Located on the Portuguese coast, just 35 minutes from Lisbon, Areias do Seixo is an architectural stunner; its concrete, steel, glass and wooden buildings blend beautifully into the surrounding landscape of sweeping dunes and sparkling ocean. All rooms (bar one) have sea views, an open fireplace, wooden patio, a spacious bathroom with rainwater showerheads, large cosy beds, and a few have jacuzzis. There’s a tranquil spa, an outdoor swimming pool (solar heated in winter), a restaurant and bar, cinema room, yoga and pilates classes, complimentary wine tasting, and bicycles for free use. The hotel runs on a zero-paper policy with all hotel information provided digitally, including menus and wine lists. To reduce energy consumption including ‘vampire consumption’, small electrical equipment is disconnected from the power source where possible and all lighting is LED, with energy produced from photovoltaic panels. The resort also supports local homeless programs by donating any food leftovers from events, and aims to keep the local waterways healthy by volunteering staff to assist with regular clean-ups. Luxury Campi ya Kanzi camp is located on a private game ranch supported by the Maasai Wilderness Conservation Trust and has breathtaking views of Mt Kilimanjaro. 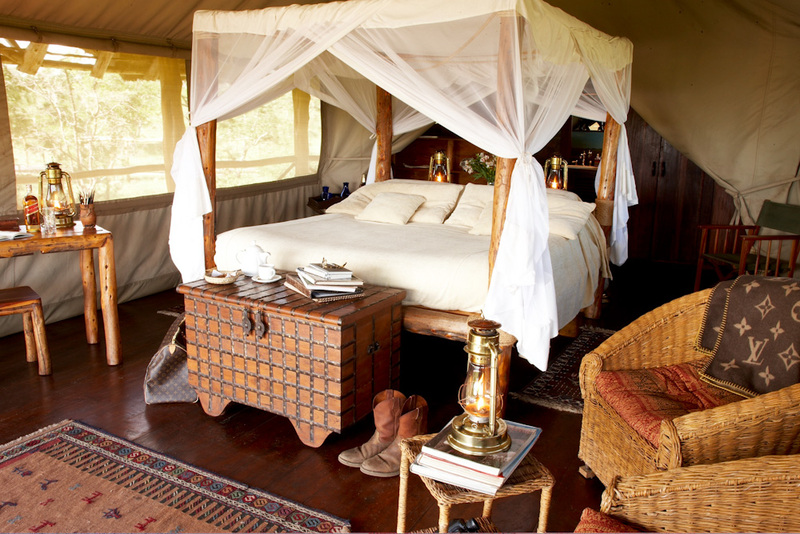 Beautifully constructed from local materials (lava rocks, thatched grass roofs), the intimate space sleeps 16 guests in eight safari tents (each with a private verandah, ensuite and cushy interiors), as well as a private villa for families that can sleep up to 10. In between safaris, guests can relax in the central lodge, where meals are served, and watch out for animals at the nearby waterhole. All food is cooked in ‘Agha’ stoves where charcoal made from coffee husks is used; this eco-friendly charcoal is a project of the United Nations Environmental Program. Energy is produced by photovoltaic panels. All carbon emissions are fully offset into the REDD+ Chuyly Carbon Project. Whitepod is a unique proposition sitting at an altitude of 1400 metres at the foot of the Dents du Midi mountain range, the start of the Swiss Alps. Set on 200 hectares, the resort comprises 15 geodesic pods, all equipped with wood burning stoves, organic luxury bedding, bathrooms and breathtaking views of the Alps. The Pod House hosts breakfast, a sauna, massage area, and bar, and the place is abuzz with activities throughout winter and summer: hiking, skiing, dog sledding, paragliding, horse riding, mountain biking, to name just a few. The domes are the hero here: made of minimal material with a round design means airflow is ambient, equating to 30 per cent less energy consumption than a conventional building. Night lighting in the resort is limited to conserve energy. Most incredibly, the colour of the pods is adapted to each season to blend in with the natural landscape: white in winter, green in summer. Soneva Fushi is set on a privately owned island in the Baa Atoll, a UNESCO Biosphere Reserve. With the philosophy of ‘no news, no shoes’, this tiny piece of paradise offers one- to nine-bedroom luxury villas, nestled among tropical foliage. Guests will not want for anything, thanks to the services of a personal butler; 11 types of pillows to choose from; 500 wines; nine dining options; a private observatory and cinema (where there’s complimentary popcorn and more than 60 flavours of ice-cream). There are also incredible once-in-a-lifetime experiences such as enjoying a private picnic on a deserted island or island-hopping in a traditional fishing boat. Soneva banned imported bottled water and now bottles its own drinking water – still and sparkling – to reduce carbon footprint. To help preserve its incredible environment, the resort has employed a full-time marine biologist who undertakes a range of activities such as monitoring the house reef, training hosts and taking guests on excursions. Bicycles and buggies are the mode of transportation to ensure zero-exhaust and low noise level. Wood waste is made into biochar and charcoal that is used at the resort. Located on beautiful Phi Phi Island, Zeavola offers a rich tropical experience on the dazzling white sands of Laem Tong Beach. With a barefoot luxury vibe, each villa (with beach access or private pool) boasts earthy interiors with teak flooring, spacious living areas and rainfall shower-heads. Energy-saving light bulbs and sensor-controlled lighting are used; all the resort’s water is sourced from local wells and rain-water while excess water is used on the jungle-like gardens. All natural waste is shredded and mulched then recycled into the gardens. too. Resort staff cook meals for the Laem Tong school on a daily basis and host a party for the children every year. Inspired by the art and culture of the Ming Dynasty, Nuo Hotel has some of the most spectacular design credentials in Beijing. The hotel has more than 400 sleek rooms, featuring understated furnishings, marbled bathrooms, freestanding tubs, and curated artworks. Dining options encompass six restaurants/cafes topped by a stunning rooftop bar while much of the produce served hails from ‘green’ farms around Beijing. Awarded LEED gold level certification in environmental building design, Nuo is making efforts to lower carbon commissions, including the installation of a high-performance air purification system and electric car charging stations. Nestled in a valley near Phewa Lake in Pokhara, Nepal, Pavilions Himalayas sets a green benchmark in the high Himalayan country. There are 15 beautifully styled villas (powered by solar energy and biogas) with fireplaces, Jacuzzis and stunning views of the remote landscape while the pool, set against sprawling farmlands, is the perfect spot to while away afternoons. The in-house toiletries are biodegradable and made from natural Nepalese ingredients. The resort has an evident local focus in terms of staff and sourcing produce and also actively supports children’s charities operating in the area. Hotel Tierra Patagonia sits on a promontory where the South American pampa meets Sarmiento Lake, offering magnificent views of Torres del Paine. Simply-styled interiors complete with handcrafted furniture, locally sourced textiles and L’Occitane amenities in the rooms complement a large central space sans cosy fire. The thoughtful architecture, constructed from sustainably harvested Lenga wood, aiming for minimal heat loss, blends well with the UNESCO Biosphere Reserve landscape. Tierra is involved in a local citizen campaign to help support the reforestation of Chilean Patagonia, with the aim to plant one million native trees. This modern city hotel features custom-designed furnishings, commissioned art and innovative design throughout the public spaces, some designed by artist-in-residence Chip Holton. The spacious rooms are furnished with specially designed Magi bedding, and there’s a vibrant Euro/French bistro, a fitness studio and pool. Proximity Hotel was the first hotel in America to receive the LEED Platinum certification from the US Green Building Council; it claims to use 39 per cent less energy than a conventional hotel. Solar panels cover 4000 square-feet of the roof; recycled materials were used to construct the bar, shelving and bistro tabletops; and complimentary bikes help reduce the hotel guests’ carbon footprint too. This exquisitely restored Grade II Victorian villa is located in the heart of Bournemouth on the southern coast of England. The 32 rooms are furnished with handcrafted pieces, cushy beds draped in goose down duvets and organic linens, with solid wood furniture carved from felled local trees. Much of the Green House’s energy is generated on site using a combined heat and power unit and the green ethos permeates smaller details too: wallpaper is made in the UK using vegetable inks and the hotel car runs on cooking oil recycled from the kitchen. The hotel is also involved in a number of community initiatives, such as the buying of hives to address bee-population decline which, of course, produce local honey.